Plus, it was excellent. You feel guilty eating it, but then you realize that eating healthy can still taste really good so you get over it. Since I’ve become absolutely obsessed with Ore Ida’s microwaveable Russet Potatoes, I pair them along with corn and/ or peas as side dishes with the chicken. It really comes out to a filling, but guilty-free meal. The only portion of the recipe that you may find tricky is rolling up the chicken after you stuffed it. My broccoli kept falling out. I had to get BF to lend me a hand so that we kept as many goodies in there as we could. Here’s the original recipe with the ingredient list and instructions if you want to give it a try. 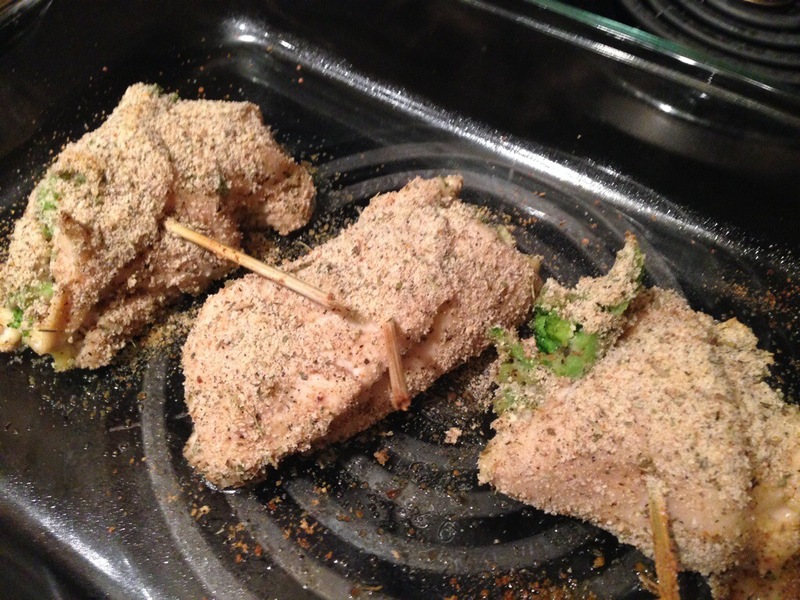 Great healthy take on stuffed chicken! This sounds delicious. It’s excellent. I highly recommend it. Filling, but still healthy.